"Hilton Hotel" redirects here. For the parent company, see Hilton Worldwide. For other uses, see Hilton Hotel (disambiguation). Hilton Hotels & Resorts (formerly known as Hilton Hotels) is a global brand of full-service hotels and resorts and the flagship brand of American multinational hospitality company Hilton. 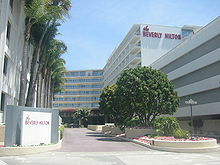 The original company was founded by Conrad Hilton. As of 2017, there were more than 570 Hilton Hotels & Resorts properties in 85 countries and territories across six continents. Properties are either owned by, managed by, or franchised to independent operators by Hilton. Hilton Istanbul Bosphorus (1955) was built as the first Hilton hotel in Europe and is currently the longest serving Hilton hotel outside the United States. It appeared in the James Bond film From Russia with Love (1963). Hilton Hotels & Resorts is Hilton's flagship brand and one of the largest hotel brands in the world. The brand is targeted at both business and leisure travelers with locations in major city centers, near airports, convention centers, and popular vacation destinations around the world. Hilton Hotels & Resorts participates in Hilton Honors, Hilton's guest loyalty program. Members who book directly through Hilton-owned channels receive exclusive discounts and amenities such as free Wi-Fi, digital check-in, keyless entry, and the ability to use a mobile app to choose specific rooms. Conrad Hilton founded the hotel chain in 1919, when he bought his first property, the Mobley Hotel, in Cisco, Texas. The first hotel to bear the Hilton name was the Dallas Hilton, a high-rise that opened in Dallas, Texas in 1925. In 1954, at the Caribe Hilton Hotel's Beachcomber Bar in San Juan, Puerto Rico, Ramon "Monchito" Marrero reportedly created the Piña Colada. The Conrad Hilton Hotel in Chicago figured prominently in the 1968 Democratic Convention police riot that occurred on Michigan Avenue and across the street in Grant Park on August 28. During the riot the demonstrators took up the chant "The whole world is watching", and the hotel's doors were locked for the first time in its history. The hotel suffered minor damage as a result of the violence, as a couple of street level windows gave way under the weight of dozens of protesters being pushed up against them by the police. John Lennon and Yoko Ono held their first Bed-In for Peace between March 25 and 31, 1969, at the Amsterdam Hilton, in Room 902 (renumbered to Room 702 during renovation). This room became a popular tourist destination. In the London Hilton bombing of September 1975, a bomb exploded in the lobby of the London Hilton on Park Lane killing two people and injuring 63. With construction on the Beirut Hilton finished, the hotel was scheduled to open on April 14, 1975, but the Lebanese Civil War erupted exactly one day before the April 13 Grand Opening date. The hotel never opened and was severely damaged during the war, and the building was demolished in the late 1990s. However, a different hotel was established later, under the name "Hilton Beirut Grand Habtoor", in the nearby eastern suburb. Later on,[when?] the Hilton Chain bought the Metropolitan hotel directly facing the Grand Habtoor and renamed it "Hilton Metropolitan". 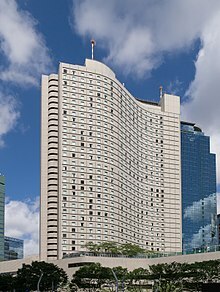 On February 13, 1978, the Sydney Hilton Hotel was the site of one of the few terrorist incidents on Australian soil, when a bomb blast killed three people (two council workers and a policeman). 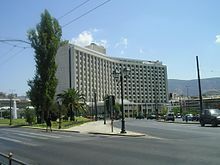 The Hilton Nicosia in Nicosia, Cyprus, was the scene of the assassination of Youssef Sebai, an Egyptian newspaper editor and friend of Egyptian President Anwar El Sadat, on February 19, 1978. The assassination and the hijacking of a Cyprus Airways DC-8 at Larnaca Airport led to the Egyptian raid on Larnaca International Airport by Egyptian forces. The intervention by the Egyptians led to the deterioration of relations between Cyprus and Egypt. In 1989, Hilton established the Hilton Honors program, Hilton's guest loyalty program. On October 24, 1999, the four double columns of the left hand side of the then modern Barbados Hilton in Needham's Point, St. Michael, was collapsed and imploded inwards in just ten to fifteen seconds when the earthquake had rocked Barbados. It was later demolished in May 2005 after they constructed the new Barbados Hilton in January 2005. In 2004, Hilton Hotels opened their new Kuala Lumpur property in KL Sentral, directly opposite the main entrance to the Sentral Terminal, as the replacement for their former premises in Jalan Sultan Ismail. The latter was the first internationally-run hotel in the city when opening in 1973, and changed management in 2002 (renamed Crowne Plaza Mutiara) before being demolished in 2015 for a (currently on hold) mixed-use development. In 2009, the company relocated its global headquarters from Beverly Hills, California to McLean, Virginia. In 2009 Hilton opened Canada's tallest hotel at 58 stories, in Niagara Falls, Ontario. In late 2010, Hilton announced a name change of the Hilton Hotels brand to Hilton Hotels & Resorts along with a new logo design, as part of a rebranding effort for the flagship brand. In March 2013, Hilton announced that it would be entering Burma for the first time with the construction of a 300-room hotel in Yangon. In 2015, approximately 20 Hilton Hotels & Resorts properties were inducted into the Historic Hotels of America organization. Among these hotels were Hilton Fort Worth, which hosted John F. Kennedy's final speech, and Hilton Hawaiian Village Waikiki Beach Resort, the setting of the film Blue Hawaii. In 2016, Hilton N’Djamena opened in Chad. It was the brand's first property in the country and the 100th country Hilton began operations in worldwide. In June 2016, Hilton opened his first hotel in Estonia and in the Baltic states. In 2017, Hilton announced that it will remain the sponsor for McLaren until 2021. Hilton is one of the oldest sponsor of F1 series and is sponsoring McLaren since 2005. In October 2017, Hilton announced it had committed a total of $50m (£37.8m) over five years to its Hilton Africa Growth Initiative to support the continued expansion of its Sub-Saharan African portfolio. In early 2018, Hilton will be all set to open their first hotel in Bangladesh designed by Mustapha Khalid Palash. In March 2018, Hilton opened his first hotel in Serbia. It is a four-star hotel located in Belgrade. ^ Frances McMorris (May 6, 2016). "Westshore hotel gets $4.5 million facelift". Tampa Bay Business Journal. Retrieved May 12, 2016. ^ Refreshed Hilton Hotels & Resorts Brand Identity Emphasizes Leisure Portfolio. ^ "Company Overview of Hilton Worldwide Holdings Inc". investing.businessweek.com. Retrieved August 21, 2014. ^ "Best Hilton Hotels & Resorts". U.S. News & World Report. February 1, 2017. Retrieved February 27, 2017. ^ Jennifer Rooney (October 5, 2011). "Brand Power To The People: J&J Takes Lead In Forbes Ranking". Forbes. Retrieved May 12, 2016. ^ "Best Hilton Hotels & Resorts". U.S. News & World Report. Retrieved May 13, 2016. ^ Lyn Mettler (May 3, 2016). "When It Pays to Book Directly with a Hotel". U.S. News & World Report. Retrieved May 13, 2016. ^ Karla Bowsher (April 19, 2016). "3 Major Hotels Offering Discounts for Direct Bookings". Money Talks News. Retrieved May 13, 2016. ^ "main page". Conrad N. Hilton Foundation. Archived from the original on February 9, 2007. ^ Carmack, Liz (2007). Historic Hotels of Texas: A Traveler's Guide. Texas A&M University Press. p. 156. ISBN 1585446084. Retrieved May 10, 2015. ^ Sarah Greaves-Gabbadon (May 8, 2015). "In Puerto Rico, a tale of two piña coladas". USA Today. Retrieved May 13, 2016. ^ "Walker Report summary – History of the Federal Judiciary: The Chicago Seven Conspiracy Trial". fcj.gov. ^ Newell, Martin (March 19, 1999). "Independent on Sunday". The Independent. London. Retrieved April 5, 2009. ^ "Beirut Hotels - Hilton Beirut Habtoor Grand, LB". Retrieved February 11, 2016. ^ "Hilton Hotels & Resorts debuts new brand identity". Hospitality World Network. Retrieved March 31, 2011. ^ Maierbrugger, Arno (April 2, 2013). "Hilton to open first hotel in Myanmar". Inside Investor. Retrieved April 2, 2013. ^ Nancy Trejos (November 18, 2014). "Take a tour of Hilton's 20 Historic Hotels". USA Today. Retrieved May 13, 2016. ^ Nancy Trejos (January 21, 2017). "Hilton marks a milestone; enters 100th country". USA Today. Retrieved February 27, 2017. ^ "Täna avatakse Hiltoni hotell". Äripäev (in Estonian). Retrieved August 5, 2018. ^ Sylt, Christian. "How Hilton Uses Formula One To Drive Bookings". Forbes. Retrieved April 3, 2018. ^ "U CENTRU SRPSKE PRESTONICE OTVOREN HOTEL HILTON! Vučić: Isplati se ulagati u Beograd". Pink.rs | Najbrži portal u Srbiji (in Serbian). Retrieved March 1, 2018. ^ "Hilton Belgrade". June 18, 2018 – via www.telegraph.co.uk. 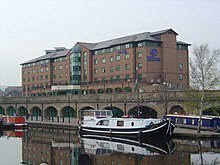 Wikimedia Commons has media related to Hilton Hotels & Resorts.